I'm pretty excited about this post because I haven't actually had a Stitch Fix box to review since I started this blog! 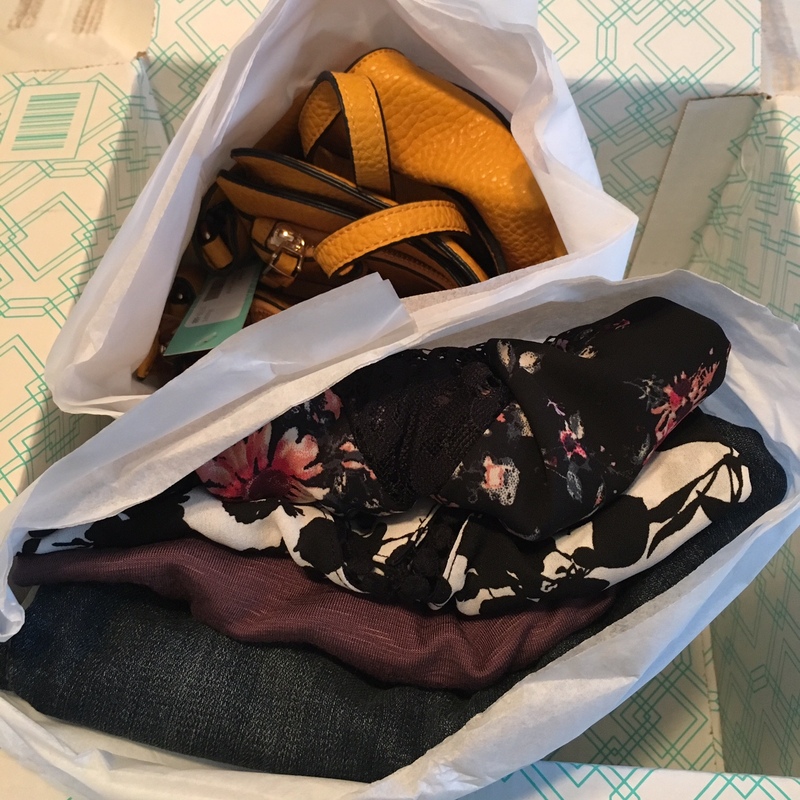 I've been getting Stitch Fix boxes for about two years, but because I still love to shop and I have expensive taste, I don't get a box every month. And sometimes, I get a 5/5 box and have to take another month or two off for my bank account to recover. Which is what happened last fix! 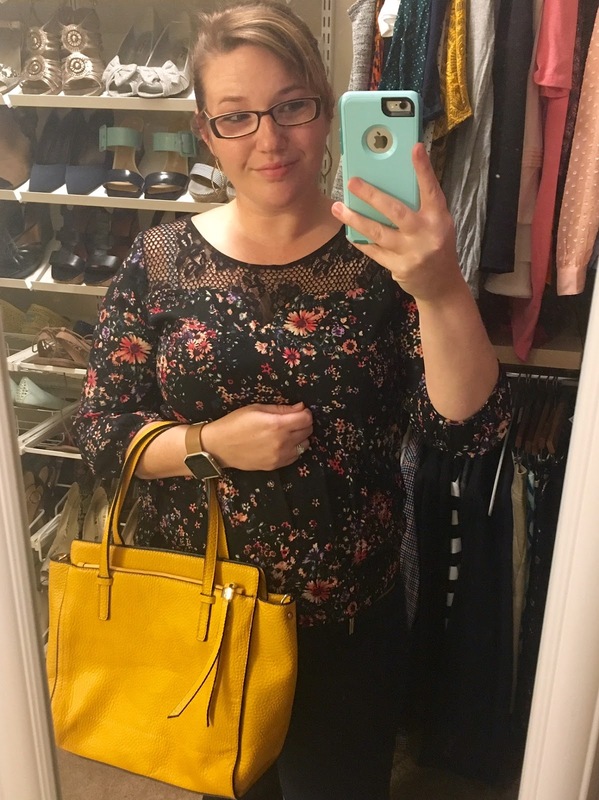 If you haven't ever heard of Stitch Fix, it's a personal styling service. You fill out a questionnaire that helps the stylists determine your style and how to size you. 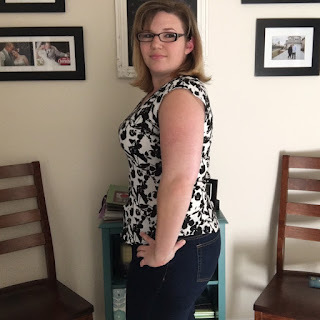 My favorite thing about the questionnaire is that it allows you to specify not only the style of clothes you like (preppy, boho, casual, etc), but also the type of clothes you want (professional, casual, date night), how much and often you want each of those, and what you want to show off (cleavage, arms, back, legs, etc). Once you've filled that out, you determine your price points, how often you want a fix and then write your stylist a note. You can also do a Pinterest board to help your stylist get a better idea of your style. I have my fixes set for every other month and most of my price points are in the $50-$100 range. This month, I tried something new. I've been compiling a Pinterest board of photos of me in items that I've kept from my fixes. This helps me keep up with what I've purchased, but I thought my stylist might also like to see how things actually look on me. I mentioned it in my stylist note and in her note back to me, Kelly referenced my new board! How cool is that? For this fix, I mentioned that I had lost some weight since the last box and was eager to try some outfits that would show off my hard work. I've also been begging for a new bag for a while. So let's see what I got! I really liked this top. The lace detail up top was pretty and while I'm not a huge floral fan, it was subtle enough to not be too girly for me. 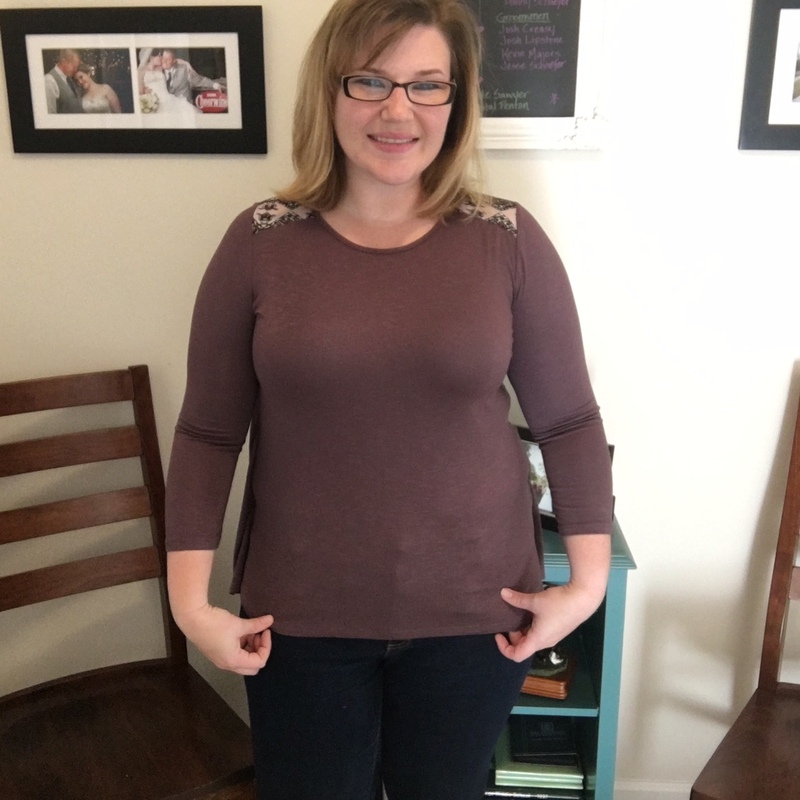 I recently changed my sizes from XL to L. I think I'm somewhere in between the two for Stitch Fix. This top didn't have any give and while it fit, I know that I would be messing with it and adjusting it every five minutes. Also, the arms were just a bit tight and I felt like I had to do some fancy maneuvering to get out of the shirt without busting the fabric. The other downside to this top is the lace up top. I have quite a few tops like this. While I love them and think they are fun. I don't always feel comfortable wearing them to work and all my shirts have to do double duty since I do a capsule wardrobe. So back it went. Also, pardon the purple bra straps. Oops. Half of what I own from Stitch Fix is Papermoon. Apparently that brand and I just get each other. This top looks a lot like one I already own. But I don't care. Because I love it. The fit is perfect and the fabric is so super soft. It seriously is like something I could take a nap in. 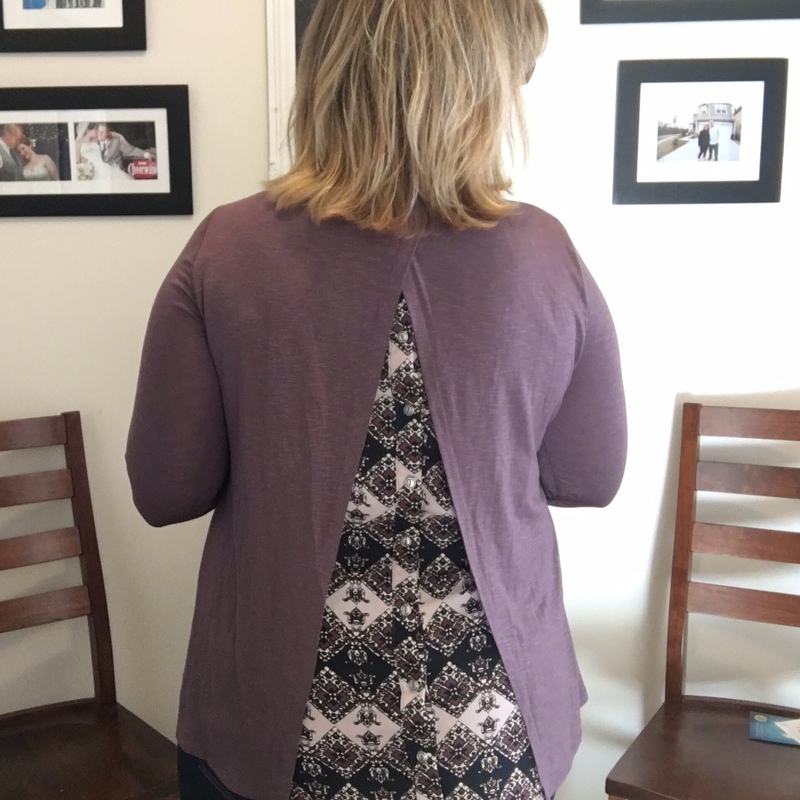 The buttons and detail on the back and shoulders are really fun. I also have a huge obsession with buying purple. This one was a keeper! Also, because I believe in calling out real life, I started experimenting with taking pictures not in my closet, but then I had to go to church and life happened and daylight does not exist after work anymore. So half my pictures are in my closet and the other half aren't. Blogger problems. I've been living in a capsule wardrobe the past two months and one thing I realized is that I desperately need some tops that go under all my cardigans. This one fits the bill perfectly. The top is a bit tighter than I prefer. I could probably size up to an XL, but then I worry that I'd be in the same boat I'm in with the rest of my XLs where they are too big. Again, the fabric in this top doesn't have any give and I'm between a L and XL. But the cut is so flattering! I paired it with some of my cardigans to see if I could still wear it until I lose just a bit more weight (cause I'm not going to wear it by itself right now anyway) and I can! So I kept it! 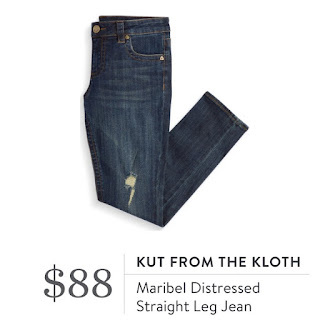 I wanted to love these jeans. I did. But they are too tight and my mom and I just went jean shopping for my birthday and I got about 3 pairs. So I'm not really all that bummed that they didn't work out. Back they went! You get the photo from my app since I couldn't breathe in the jeans. I have been begging for a new bag. 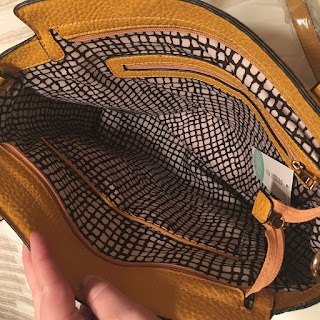 My last bag from Stitch Fix was one of my favorites and I wore it until it started falling apart. I've yet to find one to replace it, so I went back to my old Dooney, which is also falling apart. The purse struggle is real! I really, really wanted to love this. I loved it in my sneak peek (you're really not supposed to peek, but I do). I loved the mustard color - it's one of my favorites this season! I didn't love the handles, they didn't seem substantial enough for me. The size was also a bit smaller than I prefer. 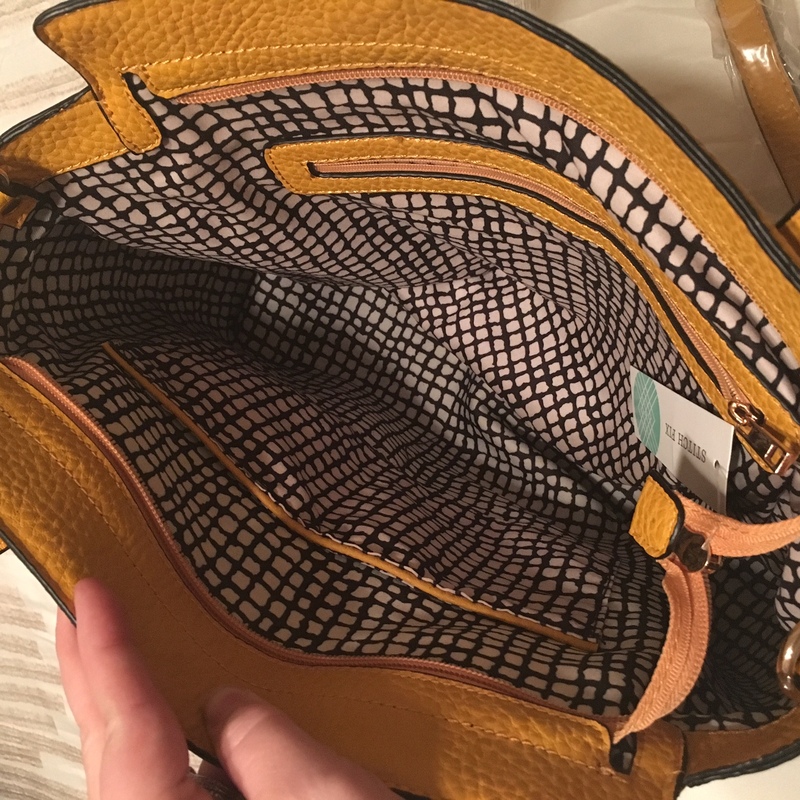 I know I'm getting a new 10" laptop for the birthday/Christmas and I really want my next purse to be able to handle it. Overall, this just didn't meet my ridiculously long list of requirements for a new bag. Back it went! This fix was only a 2/5, which was actually good. 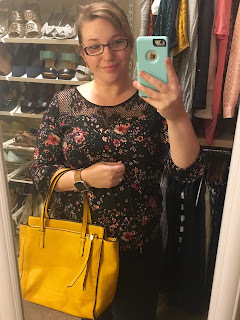 I went shopping with all my birthday deals this past weekend (which I'll be blogging about next week!) and didn't want to buy more than two items out of this fix. So only two working out of five was just right for me! I really love my stylist Kelly. She reads my notes, looks at my Pinterest board (and now the new one!) and always finds pieces for me that fit my life. I'm super happy with this box and look forward to my next fix, which will be in January! Which is kinda crazy! What are your thoughts? Would you have kept anything I sent back? I have often wondered how women do stich fix every month. Love your review. I wonder the same thing! Or the women that get multiple boxes a month! That cuts into my shoe budget! I want to know where you got your shoe shelves! The Container Store!! We did their Elfa system. It was a huge expense, but so, so worth it. I have stationary shelves, high-heel and flats shelves that pull out and spaces for boot boxes. There's room for 84 shoes total cause I have a shoe problem! 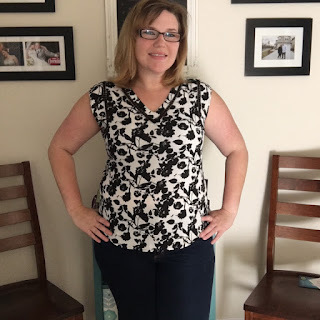 I did Stitch Fix every few month or so for a while and I often really liked the items I got but sometimes I felt like the stylists didn't pay attention to my requests. Once I asked for a fix of all bottoms and got like maybe two pairs of pants. It was a little frustrating. But you got some really cute things in your fix, and you made the right choices! 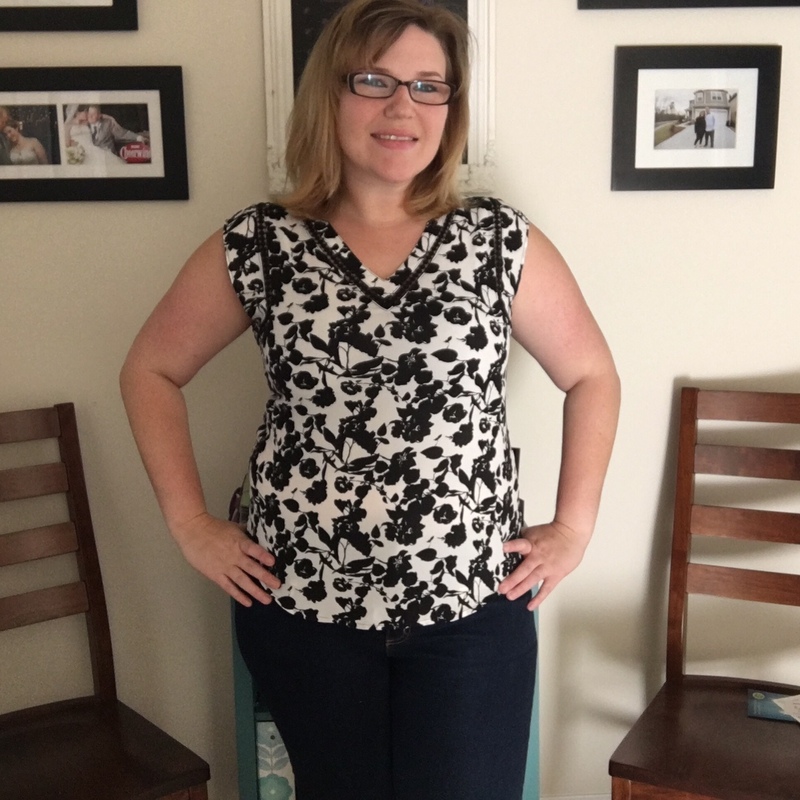 that papermoon top is gorgeous on you!!! 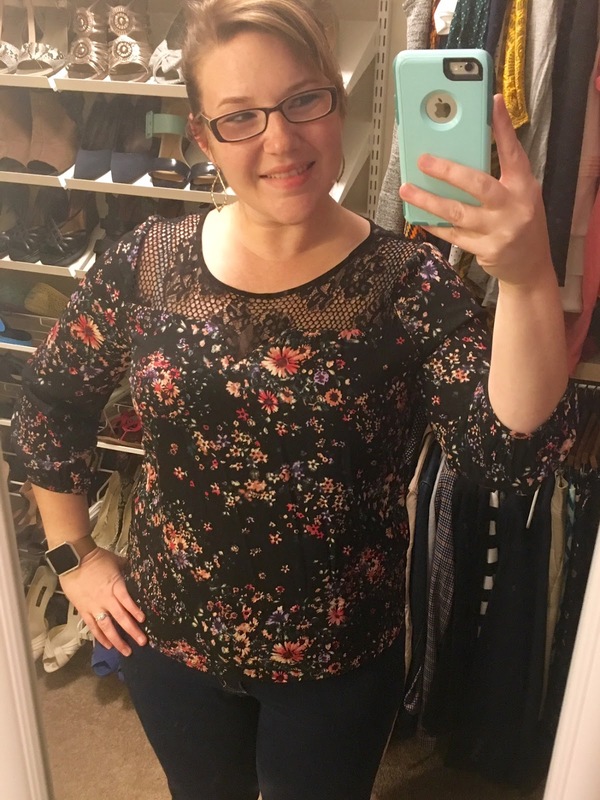 i loooooove Stitch Fix! I agree with you about the color of the purse it is amazing. You really had some tough choices. I love stitch fix as well. And I am normally a 5/5 girl as well. The Papermoon top is so gorgeous!! !